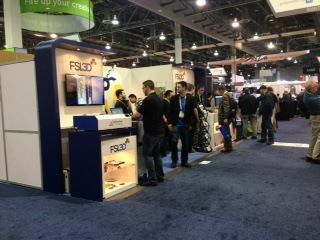 FSL3D, a pioneer of advanced 3D Printing technology headquartered in Las Vegas, announced several groundbreaking products at CES 2015. The team announced $10M in funding in November 2014 and have been hard at work since to gear up for these releases. At CES 2015, they presented a VAT technology breakthrough, rolled out a new product line, and introduced new performance resins. The team from FSL3D unveiled patent-pending SuperVATTM technology at CES 2015. The technology eliminates the problem of consumable vats used in most resin-based 3D printers. Instead of using a PDMS/silicone release layer, FSL3D has developed a special material that does not cloud/fog even after several hundred thousand print cycles. In addition, due to lower release forces, SuperVATTM makes large prints with heavy infill more reliable. Made from a sturdy metal frame, SuperVATTM is the last VAT container a consumer needs to buy. A drop-in SuperVATTM replacement option will be available for all FSL3D Pegasus 3D printers starting at the end of January 2015. The FSL3D team also unveiled their new Phoenix Professional Line of DLP Printers. The Phoenix Professional Line is slated to launch with two new DLP Printers with 50 micron XY resolution: Phoenix Touch 1080P DLP and Phoenix Touch Pro UV LED DLP. Phoenix Touch 1080P uses a consumer-level DLP projector and offers a build area of 96mm x 54mm x 100mm. Phoenix Pro Touch UV LED uses professional grade all-glass precision DLP optics for the highest resolution available at its price point and offers a build area of 64mm x 40mm x 100mm. In addition, the UV LED bulb is expected to last 20,000 hours and cuts exposure time in half compared to regular projector bulbs. Both Phoenix Touch 1080p and Phoenix Touch Pro UV LED DLP will ship with SuperVATTM technology. The Phoenix Professional line of 3D DLP Printers will be officially unveiled in the middle of Q1 2015 with a targeted ship date of Q2 2015. Lastly, the FSL3D team announced its direct castable and flexible resins. Direct castable is formulated to leave no ash after burnout and is available at half the price of the industry standard. Direct castable resin is expected to ship by end of January 2015 with flexible shortly afterwards. About Full Spectrum Laser: Founded in 2010 in a Las Vegas garage, Full Spectrum Laser and wholly-owned 3D printing subsidiary FSL3D designs, manufactures, and sells a full range of consumer and industrial grade laser products. As a highly- integrated company, FSL produces all electronics, software, mechanical hardware, and chemistry in-house for the tightest integration of engineering disciplines. FSL creates superior price / performance products through an emphasis on innovation and engineering excellence. The Company’s product assembly, sales, customer support, logistics, and administrative groups are also in Las Vegas. FSL was founded by Henry Liu, a Stanford University PhD in Mechanical Engineering and Applied Physics. FSL has grown rapidly since its inception, including entering the 3D printing market in 2013. To learn more about FSL and FSL3D visit www.fslaser.com and www.fsl3d.com.